Donald Trump Jr. speaks at a Get Out The Vote Rally on Tuesday at the UNOH Event Center in Lima. Donald Trump Jr. and Keith Cheney, Chairman of the Allen County Republican Party, speak at a Get Out The Vote Rally on Tuesday at the UNOH Event Center in Lima. LIMA — No matter where you looked in the UNOH Event Center Tuesday afternoon, you’d likely see Donald Trump Jr.’s face — projected onto walls, displayed on television screens or standing right in front of you. The “first son” took the spotlight and kept it until the crowd gave him a standing ovation. The 40-year-old has been active this election season traveling from state to state with his girlfriend, former Fox News anchor Kimberly Guilfoyle, and on Tuesday, the political duo came to Lima to pump up local conservatives about voting in the midterms. “Trump is on the ticket. The other side has made no bones about it. They want to impeach him. For what? For the greatest job numbers in history. For the lowest all-time African-American employment? You want to reverse that? You want to reverse all-time low Hispanic unemployment? They must be racist,” Trump said. While much of Trump’s message aligned with many of Republican talking points celebrating the last two years of President Donald Trump’s administration — low unemployment, two conservative judges on the court, talks with North Korea — his speech was clearly an offshoot of Trumpian tendencies, peppered with one-liners, flippant jokes and a steady bashing of the Democratic agenda. While Trump may have headlined the rally, a surprise visit from Senate candidate Jim Renacci acted as the opener. Joining him on stage were Republican National Committee Co-Chair Bob Paduchik, Ohio Republican Party Chair Jane Timken, Allen County Republican Party Chairman Keith Cheney, state Rep. Bob Cupp, R-Lima, and state Sen. Matt Huffman, R-Lima. Renacci spoke briefly about his incumbent opponent, Sen. Sherrod Brown, labeling the senator as a far-left liberal long-time politician misrepresenting himself as a populist in a conservative state. Trump closed his speech with a call to action asking the crowd to vote for Renacci as well as Republican governor candidate Mike DeWine in order to continue his father’s legislative agenda. “They understand what my father is doing,” Trump said of the two. 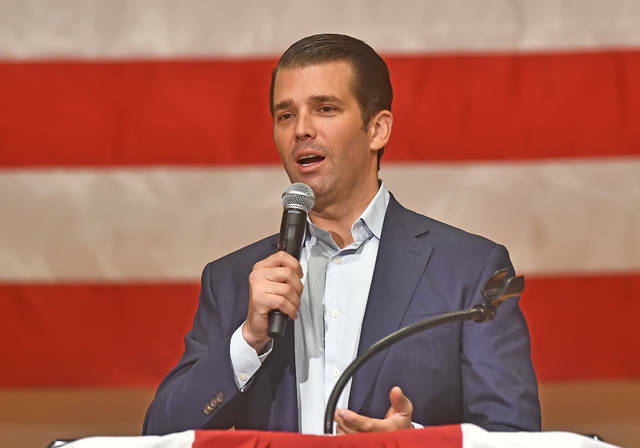 https://www.limaohio.com/wp-content/uploads/sites/54/2018/10/web1_Trump-Jr-RP-001.jpgDonald Trump Jr. speaks at a Get Out The Vote Rally on Tuesday at the UNOH Event Center in Lima. 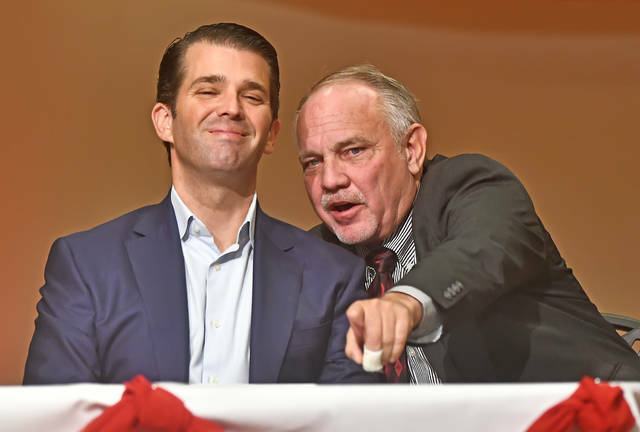 https://www.limaohio.com/wp-content/uploads/sites/54/2018/10/web1_Trump-Jr-RP-020.jpgDonald Trump Jr. and Keith Cheney, Chairman of the Allen County Republican Party, speak at a Get Out The Vote Rally on Tuesday at the UNOH Event Center in Lima.